Sydney born and raised in Brisbane, Naomi has beeninvolved in music since a young age. She is a proud Badtjala (Bat–‐chu–‐lla) woman from the Fraser Coast Region. At just 20 years old, Naomi graduated with a Diploma of Performing Arts from The Aboriginal Centre for the Performing Arts (ACPA). She has been coached vocally by Dania Cornelius, Skye Parker, Lara Boyle and Zoe Georgikas–‐Ray. Her musical influences are Alicia Keys, Ella Fitzgerald, Natalie Cole, Lianne La Havas, Michael Jackson and Ray Charles to name a few. Her dance background and vocal skills make her perfect for The Supreme Dreams, with whom she has been performing since late 2013. 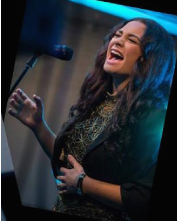 Naomi is currently studying a Bachelor of Jazz and Popular Music at the Conservatorium of Music in Mackay. She has performed at the Adelaide Fringe Festival with the Supreme Dreams, at QPAC with ACPA’s production Blak Electric and at the Royal International Nova Scotia Tattoo with OzScot Australia.